Many Tourists including Delhi-ites have voiced their interest to visit Garden of Five senses in different travel forums, and especially at Hop On Hop Off Customer care. There are some easy straightforward ways to reach there, if you are only planning to visit the Garden then go for a public transport, I usually prefer Metro over DTC Bus. On the other hand if you are a visitor to Delhi and looking to visit this beautiful garden along with other Delhi' Tourist attraction, then a Metro or a HOHO (Hop On Hop Off) Bus is a better option. From there it is another 2.7 Km . 10 mins by Auto-rickshaw. Check the Map for Directions from Saket Metro. Get down at Saidulajab (Saket) DTC Bus Stop with 680,500,427,501, 512, 522A, 534. From there it is another 1.2 Km. 5 mins by Auto-rckshaw. From there it is another 3 Km. 10 mins by Auto-rckshaw. 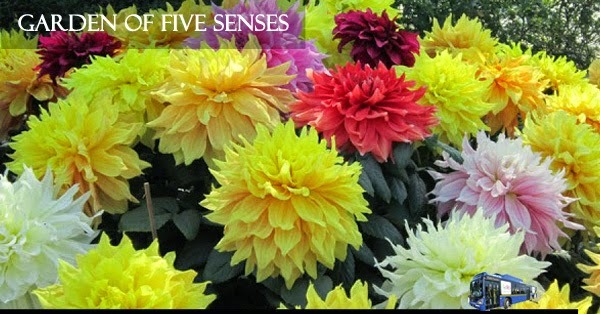 For Open & Close Timings and What to expect, Read "Do not miss Garden of 5 Senses"
I leave you with some fascinating evening images. Enjoy ! Last time I saw some great toys with Aluminium Scaffolding machine. It was automatically do work great..